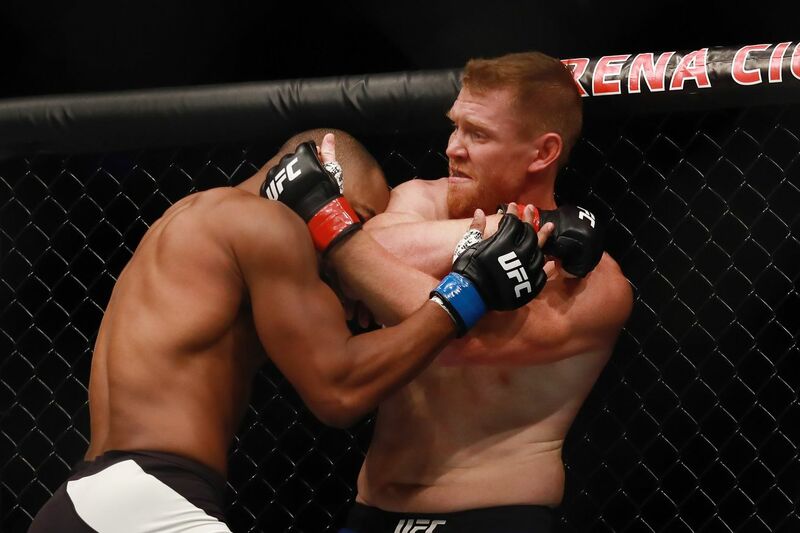 Ultimate Fighting Championship (UFC) Middleweight veterans Rashad Evans and Sam Alvey threw down last night (Aug. 5, 2017) at UFC Fight Night 114 inside Arena Ciudad de Mexico in Mexico City, Mexico. I’ve opened quite a few previous with some variation of “there was a lot on the line for … last night,” but it was especially true for Evans. The former Light Heavyweight champion has struggled to find any success, losing three straight fights and looking pretty pedestrian in the process. To remain on the roster, his second bout at 185 lbs. needed to turn out better. On the other hand, Alvey has proven to be pretty consistent. He’s not a world-beater, but he’s a tough out that tests whether his opponents can fight with any sort of strategy or maintain a 15-minute pace. After a minute or so of staring, Evans shot a naked double along the fence, but it was stuffed. With his back to the fence, Alvey found home for some decent shots, landing a hard knee and elbow. Evans continued to level change back into the shot, but Alvey’s use of underhooks and the double-collar clinch stopped his takedowns. With about two minutes remaining, Evans finally secured a takedown, but his opponent popped up pretty quickly. In the closing portions of the round, Evans was the more active man, pushing forward and landing some decent right hands. Evans’ control along the fence and a few decent punches earned him the round. “Suga” scored a nice body kick at the start of the round, but suddenly it was Alvey backing his opponent up. While on the offensive, Alvey landed a couple good right hands. He began to find range for his left as well, and Alvey continued to defend takedowns in the mean time. At one point in the round, Evans landed a brief takedown and wound up in the clinch. He controlled his foe along the fence but still ended up eating more shots, and he seemed exhausted on the break. Alvey finished the round walking his tired foe down and firing shots. The third round continued in really similar — and fairly boring — fashion. Alvey stalked his opponent, flicking out jabs and occasionally committing to punches. Meanwhile, Evans threw about one right hand per minute and mostly shot for unsuccessful takedowns. Alvey didn’t do a whole lot besides defend takedowns, but he did land far more shots in the clinch and at range. At the end of a very uneventful fight, Alvey’s hand was raised.